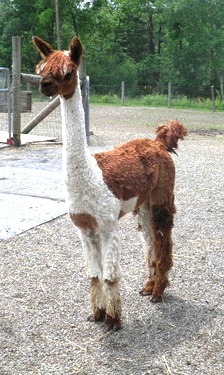 2013 male cria "Marauder's Blade"
Chipolte is a very handsome male with a beautiful Suri head. He has gorgeous tight lock structure right to the skin, bright luster and a proud upright prescence. He has a very typey head style and fluid movement when he walks. Check out his pictures, they speak for themselves! Notice his superbly level topline, his balanced neck and leg proportions and they way his fleece drapes beautifully against his well built frame. Chipolte will "spice" up any breeding program. Chipolte is a very handsome male with a beautiful typey Suri head. He has gorgeous tight lock structure right to the skin, bright luster and a proud upright presence. He has a wonderfully level topline with a balanced neck and has perfect proportions. He displays style with fluid movement and beautifully flowing fleece that drapes against his well built frame. Chipolte is now a daddy! 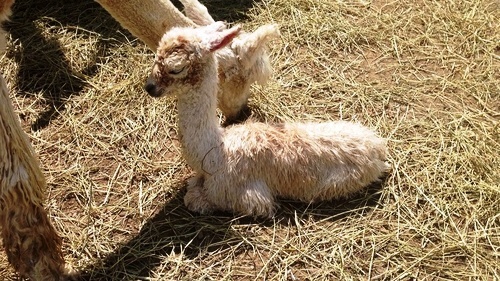 His first cria, A FEMALE, is a rose grey out of a white Accoyo dam. Way to go Chip! 2014 female cria at side she is very nice uniform,fine, fawn fleece. Her locks are tinny pencil locks. Belle is a very large female but easy to handle easy birther with plenty of milk. She normally throws color when bred to color and normally produces patterns and appys. 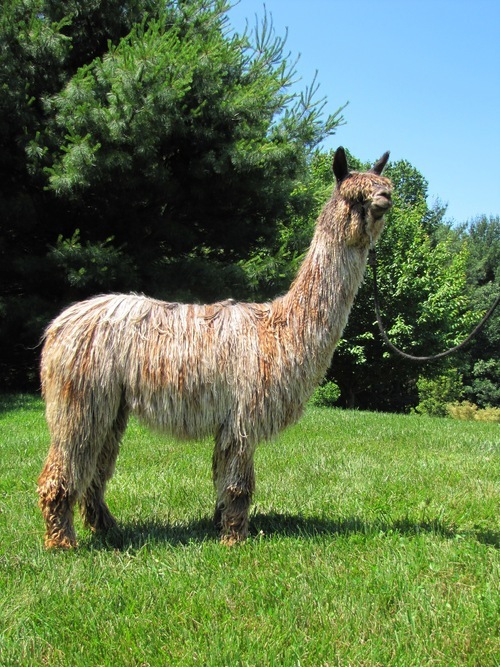 Azteka is a stunning pattern female with beautiful high luster brown and white markings. She is upright, showy, and has a great disposition. I really liked Azteka's flashiness and her fine fleece. Not only that, but she is proven and easily delivered her crias, Marauder's Blade, a high luster male by the rose grey WRSR Mercury's Marauder, and Kazmere, an appaloosa and 2X Halter and 2X Fleece Champion. Her bloodlines include Blazen Saddle JAX, sire to 12X Champion PIVAL Blazen Son, aka "Sonny", true black GS Saladin, producer of champions, and Woodsedge Flash Fusion the high luster herd sire from WoodsEdge Farm. 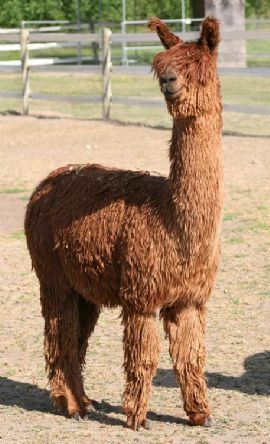 Azteka has the potential to produce a variety of colors with fineness in her crias, as evidenced by her first cria, Blade. Azteka is an easy-going female, even when pregnant, and an easy keeper. In 2016, Azteka delivered a beautiful and healthy male appaloosa cria, WRSR Kazmere by Fusion on 5/26/16. He has great luster, and fine, locked fleece. 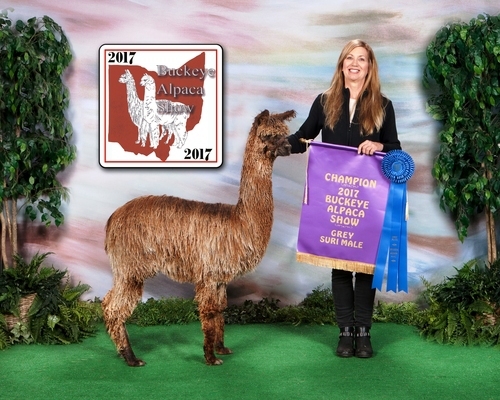 Kazmere was awarded Grey Color Champion at the 2017 Buckeye Show, and Grey Color Champion at the 2017 AOA National Fleece Show. He off to a great start with championships in both halter and fleece! She delivered another patterned male cria, white and light fawn with a few spots with a gorgeous fleece in July 2017. Azteka was rebred in 2017 to our phenomenal grey appy, Fusion, and delivered a beautiful appaloosa/pinto male weighing 19.8 lb in August 2018. His color pattern is very unusual and eye-catching. He has a pinto pattern on the back half with modern grey appaloosa on the front half. Contact Patti for more information at 443-740-4240 and details about our guarantees.